It seems to be, in life, that you either get one or the other. You either get the result that you want, or you have reasons or excuses for not getting it, the result that you want. Think about it. Has there ever been a time when you asked somebody to do something for you, or let's say you said, "Let's get these particular results for me by next Wednesday," and next Wednesday comes around, and you don't have the results? What does the person who you ask to get the results for you give you instead of what you asked for? They give you all the reasons and excuses as to why they didn't provide you with what you really asked for. Successful people don't accept reasons or excuses. People who are less successful actually think their reasons and excuses are true. I remember, I was doing a training, and one of the students said to me, and they put their hands up and said, "Dr. Luke, I don't have any excuses." And I said, "Well, fantastic! 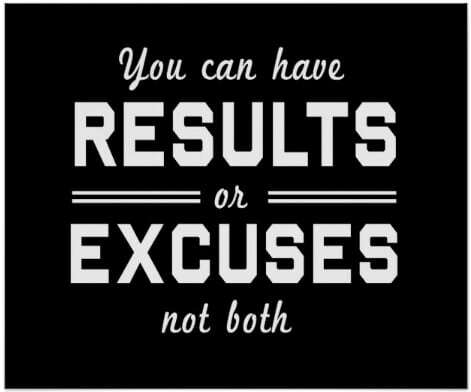 So if you've got no excuses, then you must always get the result that you want. Is that true?" "No," he said. And I said, "Well, how do you do that, then? What do you have instead of the results that you want?" And the student said to me, "Good reasons." Now, in the world of success, there's no such thing as a good reason because a reason, even if it's a good one, prevents you from having the results that you want. So imagine this. You can really just imagine now, if you put a cross through excuses, so you just didn't have any anymore, what would be the only thing that you were left with? You'd only be left with the results that you want. So here's another little challenge for you over the next few days. Start to notice what excuses you're using every time you go to create something that you want and you don't create it. What reason or excuse do you give yourself? And I bet there aren't that many of them, but I also, again, bet that the ones that are present, you make them work really hard for you. So make a note of those over the next couple of days. All the reasons and excuses is a limiting belief, a belief that isn't useful, a disempowering belief, a belief that prevents you from getting what you want. And later on, in some more of the videos that are forthcoming, you can learn how to start to change those limiting beliefs. So, just for a moment, imagine this, that at some point out in the future, being able to change all the beliefs so you no longer had any reasons or excuses for creating what you wanted. It's black and white. If there are no excuses, if there are no reasons, you'll only be left with one thing, which is the result that you want, which is what these videos are all about.